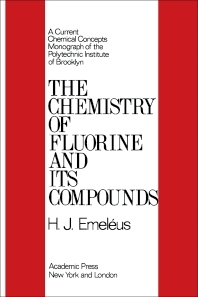 The Chemistry of Fluorine and Its Compounds is an expanded and updated treatment of the material presented in a series of five lectures given by Professor Emeleus while in residence at the Polytechnic Institute of Brooklyn in November and December, 1966. This book is one of a series of monographs made possible by a Science Center Development Grant from the National Science Foundation that enabled the Institute's Department of Chemistry to establish a Distinguished Visiting Lectureship that is held successively by a number of eminent chemists, each of whom has played a leading part in the development of some important area of chemical research. The book opens with an introductory chapter on the chemistry of fluorine. This is followed by separate chapters on halogen fluorides, oxygen fluorides, hypofluorites, fluorides of Group III, carbon fluorides; and perfluoro organometallic compounds fluorides of silicon, germanium, tin, and lead. Subsequent chapters deal with fluorides of nitrogen and related compounds; fluorides of phosphorus, arsenic, antimony, and bismuth; and fluorides of sulfur, selenium, and tellurium.